WELCOME TO MY MONEY MISSION ONLINE: PEST CONTROL AT HOME....THE ECOSMART WAY! GIVEAWAY! PEST CONTROL AT HOME....THE ECOSMART WAY! GIVEAWAY! Years ago, when I was a newbie gardener, I was clueless...absolutely clueless about plants and bugs...particularly the bugs. I would spot a bug in the garden and tell hubs, "oooh...look...so pretty!" He, on the other hand, would waste no time in squashing ...errrr...disposing of it. In time, I learned to be a little more hard-hearted towards bugs. After all, I was putting in all of the hard work and they were reaping all the benefits! However, there was a certain bug who put me in my place and I learned REAL QUICK to never, EVER squish dispose of it. 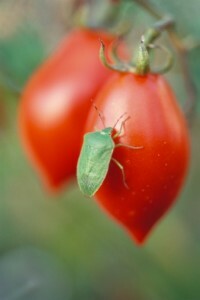 The certain bug in question is none other than the aptly named Stink Bug. Don’t squash them. You’ll release their odor, which will actually attract more bugs. Don’t wait until you see active adults. If you spot stink bug eggs, kill them right away before the problem gets bigger. Do knock both the bugs themselves and egg clusters into soapy water. Do use an electric flyswatter to zap them. Do try a contact insecticide such as Carbaryl, Permethrins, or Sabadilla directly on the bugs you find in your garden. Just be aware of the potential risks involved in using these. Do caulk around doors and windows, install and repair screens, and seal pipes and ducts that enter crawlspaces to prevent stink bugs from entering your home. "Kills and repels over 100 home invading pests: Ants (including Carpenter, Red Harvester, Pavement and Argentine), Beetles, Centipedes, Cockroaches, Crickets, Earwigs, Fleas, Millipedes, Pantry Pests, Pillbugs, Silverfish, Spiders, Sowbugs, Ticks and other crawling insect pests. Unlike other insecticides, it is made from organic plant oils and kills bugs naturally to better protect your family. Plus, there’s no pesticide residue. It’s safe. It’s effective. It’s smart. Naturally." Required Entry: Comment and share why you want or need the value bundle. This giveaway will run until March 10, 2011 (11:59pm CST). I will choose a winner using Random.org and I will notify the winner by email. So, be sure that I have a way to get ahold of you! I won these last time!!! They sit and wait for bugs... Being winter we haven't had any around... But I so look forward to it! I'd like to have these because we always get ants every spring and have so many insects biting us when we are outside! Love to try new products and haven't tried these before. I need this because I hate bugs, but I hate the fumes from the other sprays and repellents that I currently use. Sometime, I feel like I am going to curl up and die or at least flinch a couple of times after spraying them. What a great giveaway! I so need this because we live next to a lake and there are so many bugs in the summer! We need these for our garden outside this year!! And to keep the bugs away from our toddler and newborn! I'd like this because my dh has allergies and we can't use products with strong chemicals.